Every fighter thinks he's got one more victory left in him, and every runner thinks he's got one more great race. Usually, they're both wrong. Many presidents ago I won a road race in my old neighborhood of Douglaston, Queens, the only moment of glory I ever had as a runner. Anyway this past weekend I was back in the old neighborhood and I noticed a sign for a combination swimming/running competition on Sunday morning. 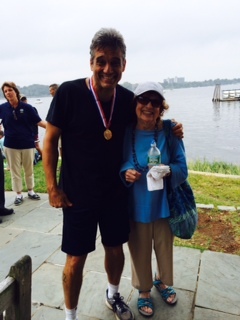 "Splash and Dash" -- a half-mile swim in Little Neck Bay, followed by a five-kilometer run. You could sign up to do both, or either event. I chose to run. Thirty years and 30 pounds later, I was making my comeback. I couldn't wait to check out the competition. There they were, eager to bolt from the starting line -- four kids, aged 13 to 7. Three of them were lovely blonde girls. That's right -- a total of five runners, including me. And I was old enough to be their (youthful) grandfather. Well, I thought, it'll be a "fun run." I'll take it easy on the kiddies. Boom, we were off! And the kids sprinted as if it were a 100-yard dash. I chuckled knowingly. "They don't understand pacing," I told myself. "They'll be gasping for breath in two blocks." Wrong. The 13-year-old girl kept going as if she'd just knocked over a bank. Soon she was a blonde speck in the distance, then totally out of sight. The 10-year-old girl was ten yards ahead of me, 15 yards ahead of me, 20 yards ahead of me... I didn't dare look over my shoulder for fear that the 7-year-old might be gaining on me. Didn't these kids have homework they should be doing? We don't get old, we get overrun. And it's really not so bad. Besides, there's always false hope, which is better than no hope! With a quarter of a mile to go I still had the 10-year-old in my sights. I got giddy, thinking maybe I could overtake her. Little did I suspect she was saving a "kick," and that's when she pulled the trigger. Another blonde speck, vanishing in the distance. Right about then I reached the street where I'd grown up. At this point I toyed with the idea of ditching the race and going up to my old room to brood on my bed. But my bed is long gone, ever since my father turned my room into his workshop. So I chugged along and finished the race to scattered cheers, applause and a little bit of laughter. I was happy to be done with it, and relieved to learn that those two girls who clobbered me are serious competitive runners. "Stick around for the award ceremony," said my friend Jamie Sutherland, one of the race organizers. "You might be surprised." "Yeah, sure," I replied. Why not? I was too stiff to stagger home anyway. Little could I have dreamed I was in for the biggest shock of my life since Christmas Eve of 1961, when Joe Bonventre informed me that there was no such thing as Santa Claus. "First place in the men's running division," said the master of ceremonies, "goes to Charlie Carillo!" What the... How was it possible? Well, the two kids who'd outrun me were girls, and all the other guys who ran the 5K had knocked themselves out earlier with that half-mile swim I'd avoided. A victory with an asterisk or two, but if I've learned anything as a 58-year-old New Yorker, it's this: Never, under any circumstances, turn down a triumph! As you may have guessed, I kept my acceptance speech short. Meanwhile, I can't hang up my running shoes just yet, because it looks like I'll be competing in this same race next year. I am, after all, the defending champ.